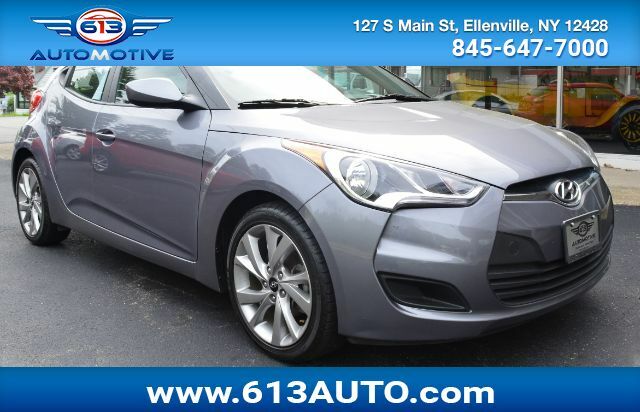 Make a powerful first impression in our 2016 Hyundai Veloster Coupe presented in eye-catching Triathlon Gray. Motivated by a 1.6 Liter 4 Cylinder that offers 138hp tethered to a 6 Speed Manual transmission to offer impressive acceleration. This Front Wheel Drive sports coupe offers over 35mpg on the open road plus distinct style and personality that makes people take notice! The athletic stance is enhanced with stunning wheels, a dual chrome center exhaust outlet and daytime running lights. Step over to the passenger side and check out the hidden third door that makes access to the backseat a breeze. The 3-door design and glass rear hatch give the Veloster a roomy interior packed with features galore. A 7-inch high-resolution LCD touchscreen, integrated Bluetooth connectivity, as well as Hyundai''''s intuitive Blue Link telematics system mean you are always connected. The advanced features don''''t stop there. With six airbags, electronic stability control, and a tire pressure monitoring system, the Veloster will keep you and your friends out of harm''''s way. Stop blending in and show off your fun-loving personality with your Veloster! Print this page and call us Now... We Know You Will Enjoy Your Test Drive Towards Ownership!